J.D. Sheldrake: You see a girl a couple of t imes a week and sooner or later she thinks you'll divorce your wife. Not fair, is it? C.C. Baxter: No, especially to your wife. When the American Film Institute announced their list of the top one hundred films of all time, it was of no surprise that Billy Wilder's The Apartment showed up on the list. Hailed as one of the best romantic comedies of all time, The Apartment was nominated for ten Academy Awards® in 1960 and won five, including Wilder's only Best Director Oscar®. When people say "they don't make them like they used to", there is a good chance that The Apartment is one to which they refer. Bud Baxter (Lemmon) is just another up and coming clerk at a large New York insurance company. Although it is not long after Bud starts letting his supervisors "borrow" his West Side apartment for quick dates with their mistresses that Bud's life is quickly changing for the better. Bud is promised a promotion, and sure enough he gets it. But soon Bud starts to fall victim to his bosses as he is relegated to working unpaid overtime while his apartment is occupied, as well as wandering the cold rainy streets after an eleven o'clock wake up call so his boss could have his bed. Soon the situation gets even more complicated when he begins to fall for Fran Kubelik (MacLaine), an elevator operator in his office who's affair with one of Bud's "tenants", big shot Jeff Sheldrake (MacMurray) infuriates Bud. Soon Bud must choose which is more important, love or his job. What is most surprising about The Apartment is that on the surface it looks like only a standard romantic comedy. But upon closer examination it is in fact an often overly tough look at big business and its politics that is just as relevant today as it was in 1960. Bud is a guy simply trying to get ahead at his job, and as is the case with most people, he will do whatever it takes to do so. If the film were to be remade (that is only a joke, please for god sakes don't do it), who knows whether it would draw criticism for being immoral, much like the recent In The Company of Men. Wilder and his collaborator I.A.L. Diamond crafted a screenplay for a pure gem of a motion picture. Everything from the pacing to the characters is close to perfect. 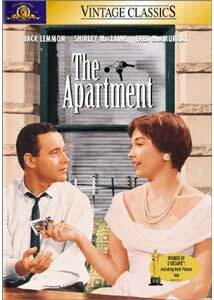 Consider the fact that The Apartment has the amazing ability to make its viewer laugh one moment and at the very next be brought nearly to tears. Such moments now recognized as classics, including Bud's impromptu spaghetti draining methods to a Christmas time breakdown by the MacLaine character, are perfectly realized bits of filmmaking. As one would assume, Jack Lemmon is terrific as Bud, and having been made a year after Wilder's Some Like It Hot, The Apartment cemented his standing as an A-list actor. MacLaine has great energy, and is beautiful and vibrant as Fran, in what I feel is the best performance in her career. And Fred MacMurray goes against type, against type at least for me since I was used to seeing him in Disney movies and on My Three Sons, as the adulterating Sheldrake and does a nice job. Image Transfer Review: The anamorphic transfer for The Apartment could easily be featured on a FOX TV special titled When Bad Transfers Happen to Good Movies. Presented in its original 2.35:1 widescreen aspect ratio, this transfers appears to be just another version of the letterbox laserdisc version with the added benefit of anamorphic enhancement. Excessive shimmering is the largest problem with the disc as several scenes are nearly unwatchable. Detail is nonexistent in most scenes and edge enhancement is a constant problem. I would suppose that given that The Apartment is forty years old a transfer of this quality might be acceptable, but this is beyond acceptable. Audio Transfer Review: The original mono soundtrack for The Apartment is presented on this new DVD, and for the most part it receives a passing grade. Dialogue is easily understood with no problems and the score sounds full and fill the room nicely. Extras Review: The theatrical trailer is offered, and that my friends is it. No more, no less. The Apartment is a true classic and should be seen by people of all ages. The new DVD from MGM leaves a lot to be desired, and it is frustrating that there are close to no extras on the disc. One can only hope that this title will be revisited by MGM at a later date with the special features that this film deserves.